CLEARFIELD – The aunt of a Blandburg man had harsh words for his convicted murderer Monday morning during sentencing court. Johnathan Blair Maines, 21, was found guilty of third-degree murder for the death of Joshua Sahm after a trial in January. Witnesses who testified during the trial painted a picture of a “drug house” where the residents did methamphetamine all night before the day of the murder. 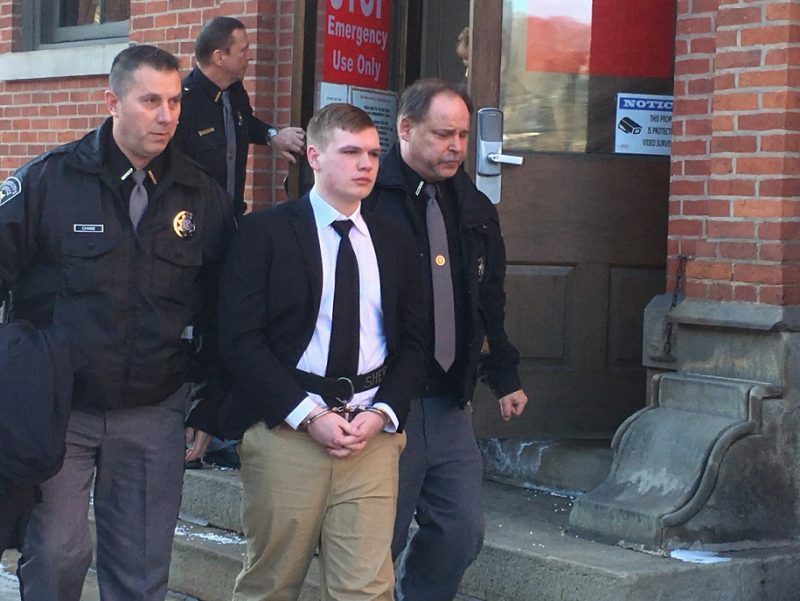 Maines stabbed Sahm in both the back and the neck because he was jealous of him, District Attorney William A. Shaw Jr. said during his closing arguments. Prior to sentencing Monday, Michelle O’Donnell addressed the court, saying her nephew was a “kind, loving, person” who loved life and being with his family. She referred to Maines as a “cowardly punk” who fled while Sahm was suffering and dying. “Our family is forever broken,” O’Donnell said. She asked Judge Paul E. Cherry to not let Maines destroy another family by giving him the maximum sentence. Comments were also made regarding Maines not showing any remorse. His attorney, Joshua Maines, explained that Johnathan has maintained that he did not commit the crime, but that does not mean he does not feel sorry that it occurred. “Our thoughts continue to be with you,” he said addressing the family members, adding that he hopes that they can be healed from their suffering. Johnathan’s father and sister also spoke, asking the judge to show mercy. Cherry then sentenced him to 20 to 40 years in state prison. Johnathan also had a probation violation on a previous prohibited offensive weapon charge. After Shaw argued for a consecutive sentence for this, Cherry gave Johnathan an additional two to five years in prison. Because Johnathan is maintaining his innocence, his attorney said he will be filing appeals challenging the evidence in this case.